Robert Corby Hyslop was born on 3 January 1857 in Ashfield, NSW, son of James Hyslop and Amelia Negus. He married Mary Eliza Lancaster (1862-1919) on 1 January 1880 in Richmond, NSW. There were 5 sons and 2 daughters. Robert Corby Hyslop died on 19 February 1928 at his residence ’Kurrara’ Etela Street, Belmore, aged 71 years and he was buried in the Old Wesleyan Section of Rookwood Cemetery. He left a Will and his estate and assets were assessed at £9,200. He lived at 35 Botany Road, Waterloo (1910). 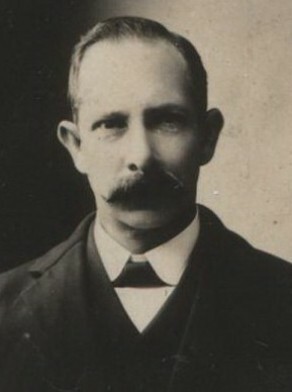 Robert Corby Hyslop was a witness at the 1909 Royal Commission held regarding a Saturday half holiday. He maintained that the bulk of his business was done on a Saturday afternoon when most people were away from work. Hyslop gave his views on the need for vaccination to Waterloo Council in 1913. It was noted that Waterloo is a populous workmen’s centre and a large proportion of the residents find employment in the city. On 24 May 1917, Waterloo Council’s Town Clerk reported that the three honour boards ordered by the council had already been filled with the names of the suburb’s AIF volunteers. Alderman Thomas Danks motioned for another two boards to be ordered. During the council meeting of 21 June 1917, a motion was put forward by Alderman Robert Corby Hyslop to include the corporate seal of the council on the board. Just three months earlier Hyslop’s own son 22-year-old Ernest Hyslop, a coppersmith at the Mauri Bros and Thomson Engineering Works on Bourke Street, Waterloo, had been killed in France in what the Sydney Morning Herald called ‘the supreme sacrifice for justice and freedom’. Robert Corby Hyslop was an alderman on Waterloo Council in 1907-16 representing East Ward.